PlayTime Family Fun Center features Over 30,000 SQ. Ft. Party Rooms for Birthday Parties, Bounce Houses, Rock Climbing, Interactive Games, Arcade Fun, Cannon Ball, Basketball, Toddler Land, Glow Golf, Mini Theater, Sweet Intentions Pamper Princess Parties/Tea Parties, build your own stuff animal, popcorn, pizza, nachos, hot dogs, juice boxes, and much more. Parents, you will have a blast playing with your children or just sitting back & relaxing while your kids have healthy fun. We are Metro Detroit’s first and best indoor inflatable party center designed for the entertainment of children and families alike. Extreme Fun's indoor play center that features 30,000 square feet of a climate-controlled setting and has several large-scale inflatables to climb, bounce and slide on. We also have a 10,000 square foot location in Lansing that is perfect for whatever type of event you might have. Our Roseville location is home to 30,000 square feet of fun. Booking a party is easy. Click the "Book Now" button below. We look forward to meeting your entertainment needs. GREAT DEAL! Great Place! GREAT FUN Visiting the Macomb Mall!! I stumbled upon this HUGE inflatable playland! Really this place is huge! Had to drag my kids out!!! It was one price to play ALL DAY!! Yippie I get to shop, surf the net and sit in the massage chair while my kids bounce all their energy out! Their Prices are so great we've been coming back at least 2-3 times a month. I haven't booked a party yet but I've seen the packages and they are VERY reasonable unlike the other places.. We can bring our own food if we want to.Beats pizza at every party! Private party rooms too! Oh yeah....I have a three year old and he had a blast in their Toddler Land with ride on toys ,kiddie rides, and make believe toy structures! I recommend this to all my friends just a Great Family place to have fun! My kids are 5 and 3 and they love extreme fun. Good price and it's unlimited play. Other places charge more and give you a set amount of time. 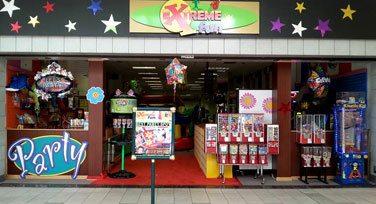 Extreme Fun is perfect for rainy and super,hot days to get the kids out. This place has the best prices around. I've tried out the bounce house but it didnt cut it for my kids. They like to play for hours! This is a good place to burn them out, and they think its a treat. I take my kids there about once a month now since I had my sons birthday there. I will definitely have more parties there, they let me run the party how I wanted Bounce house was too controlling with how the party needed to be. My family is the type to just relax and have a good time. Extreme fun was a perfect fit for my kids. GREAT PLACE TO TAKE YOUR KIDS!! We went to visit one Saturday, and the kids had the opportunity to Meet & Greet 5 different characters! The characters performance on their stage was simply AWESOME! The look on my kids face was simply priceless. It made me feel good, to see my kids having a good time. Their employees are awesome, and the store is always clean.This is a Great place for birthday parties. They have everything you need for you party under one roof. My Overall experience with good and I will continue to bring my kids there. We had a great party! We couldn’t have asked for better service and the overall experience was great. We will most definitely be back! No suggestions, just keep up the great work! Thank you!